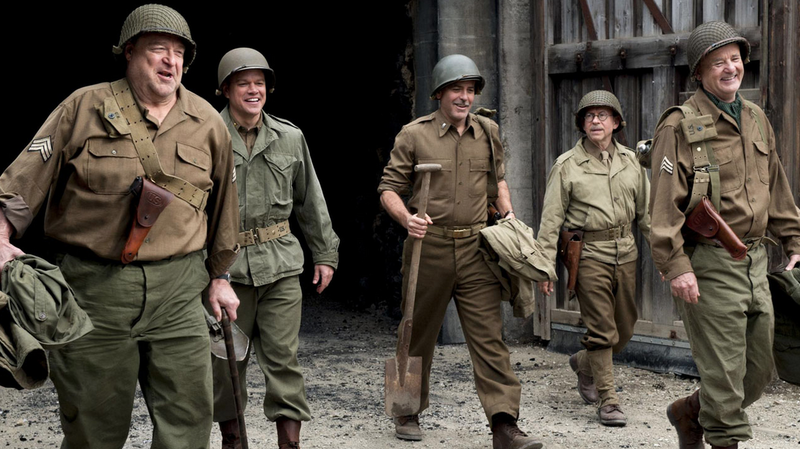 The Monuments Men is a film that looks, on the surface, to be a winner. The premise is extremely interesting, a cinematic take on the true story of a group of allied men during the Second World War whose task and ambition was to locate, preserve and return millions of pieces of art stolen by the Nazis on behalf of Hitler and his desire to create a vast ‘Führer Museum’. Combined with this attention grabbing outline is the film’s cast, a star studded affair employing the talents of, amongst others, George Clooney, Matt Damon, Bill Murray and John Goodman. This one had been on my radar for some time and I went in with eager anticipation. After seeing it, however, the question to answer is not of how much I enjoyed it, but of where exactly it went wrong. My biggest qualm with The Monuments Men is that it cannot decide whether it wants to be a serious war film or an almost parodic comedy, and in failing to firmly identify itself it falls short of either goal. This indecision directly effects the pace of the film as it continuously speeds up and slows down with every switch between drama and a lighter, quirkier tone, resulting in a somewhat tiresome viewing experience. A friend of mine likened the opening scenes in which the motley crew of museum curators and art historians are rounded up and assigned their mission to the beginning of Gangster Squad, an interesting comparison given both films fell far short of their potential. In both instances, the audience are given too little character background and depth to care about the individuals as the narrative progresses. Some characters, John Goodman as sculptor Walter Garfield for example, are given literally ten seconds of introduction before we are thrown in to the real meat of the plot, and it is therefore not surprising that one might feel ambivalent to certain roles and arcs throughout the film. However, though questionably crafted, the film is not completely without merit. The core plot is one that brings up a number of interesting questions both culturally, historically and ethically. The efforts of the so called Monuments Men were something of which I had no previous knowledge, and it was fascinating to be given an insight in to a part of the Second World War that wasn’t directly focused on military combat. The question of whether the endeavour was worth the resulting danger and human cost is one constantly asked throughout, and some of the film’s most touching and poignant moments are delivered by George Clooney’s character in his monologues about the importance of saving art and preserving a historical culture in spite of the great human loss that is occurring all over Europe. In this sense, The Monuments Men does manage to capture and express the importance of the job these men were doing. The film’s seven leading men all give admirable and impressive performances given the lack of depth with which at least half of them have to contend. George Clooney as operation ringleader Frank Stokes is, of course, charismatic and charming. Matt Damon as James Granger spends much of his screen time separated from his comrades, and gives a refreshingly calm and nuanced performance, the kind of which was absent in the blockbusting age of Bourne. The most enjoyable performances are given by Bill Murray and Bob Balaban, who as Richard Campbell and Preston Savitz form a quirky partnership that is responsible for the film’s most engaging and entertaining set pieces. The bulk of the actors including John Goodman, Jean Dujardin, Hugh Bonneville and the assortment of minor roles were generally well cast, but there is one major turn with which I have to take exception. Surprisingly, Cate Blanchett’s performance as French curator Claire Simone leaves much to be desired, a reminder that somebody who is almost certainly about to become a double Oscar winner is human after all. Her French accent was at times just plain cringeworthy, an out of character criticism for somebody who managed to master the unique tones of Katharine Hepburn. Blanchett looked awkward and uncommitted to the role, why the filmmakers did not choose to cast one of the many bankable French actresses like Audrey Tautou, Marion Cotillard or Juliette Binoche leaves one baffled. 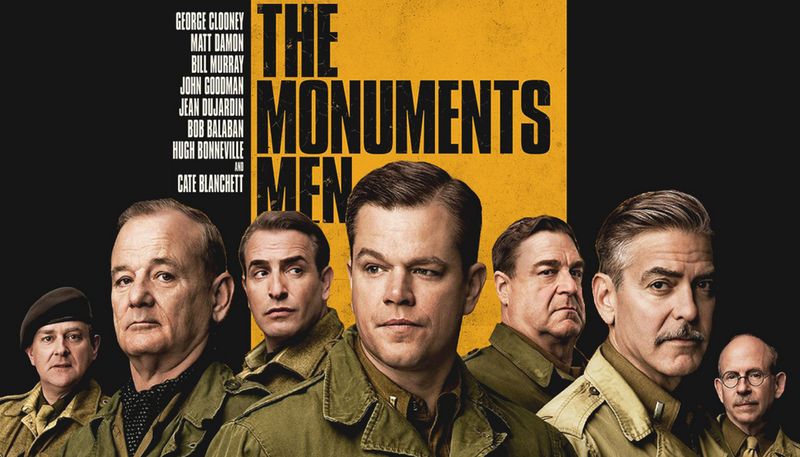 Ultimately, The Monuments Men is a better film in theory that it was in practise. This story could have made either an engrossing drama or a whimsically dark comedy, but it should not have tried to be both. The big named and mostly impressive cast do a commendable job of papering over the wide cracks and manage to turn the film in to something that is not completely a resounding waste of the audiences’ time. The pace is erratic and problematic, but the interesting plot and unique look at the Second World War are enough to make The Monuments Men worth at least one viewing. Appreciation for the real men who made such sacrifices for the preservation of art history deserve widespread recognition, it is just a pity it did not come in the form of a much better motion picture. The Monuments Men interested me since I first heard about it, but I’m even more intrigued by it now, after reading your review. I’m planning on seeing it tomorrow, I hope it will be good! Oh my God, thank you for this review. I saw this movie last weekend, and I had the exact same feelings on it though I couldn’t bring myself to figure out how to word it, for some reason. I just felt so conflicted, I guess, about which tone it had meant to achieve, same as you point out in the review, and, just, ugh. This review was spot-on. i really wanted to see this but I haven’t read a review of this film that isn’t somehow disappointed with it. Shame. I’ll wait for the DVD. Interesting comparison to “gangster squad’, and you’re right, that should also have been a lot better. Yeah, Gangster Squad was one of my biggest disappointments of last year! Such a waste of talent. I’ve heard nothing but conflicted things about this film. People seem to really want to like it, but just can’t get past how poorly it’s executed. Your comments about Blanchett were interesting. I’ve always thought she’s kind of an overrated actress… but then, I haven’t seen her portrayal of Bob Dylan yet. Briallianty detailed, you write so effortlessly! Reckon it’s worth a watch? Why thank you! I would recommend at least one viewing, the subject matter alone is interesting enough to keep you going even if the film is rather patchy! The monuments men had to face a lot of difficulties from their forces as well. Whenever they tried to convince the raiding regiment to change their course of attack and hence avoid the unnecessary damage to the artifacts that might come in way they almost always refused to do so. Very nice review. I’m one of the few who absolutely loved the film. There was an effective bit of nostalgia that really worked for me. Clearly Clooney was going for a vibe similar to the ensemble war pictures that were popular in the 1960s and early 1970s. I loved that. I also didn’t mind the humor (minus a couple of scenes) mainly because it was consistent with these characters. I am really anxious to see it again to give it a more critical eye.